You regularly wash your yoga pants and gym sweats and always make sure to wipe down equipment after you use it. But often one of the most important yoga accessories you use gets forgotten when it’s time to clean up. Your yoga mat is the foundation of your practice, and over time sweat, dirt, and dust can make it dingy, unsanitary, and diminish the “stickiness” of your mat. However, it’s very easy to clean and maintain your yoga mat so it’s in the best condition whenever you practice. This article covers everything you need to know about how to clean a yoga mat, including a recipe for an easy DIY yoga mat cleaner. The best way to care for your mat is to clean it regularly to keep it in tip-top shape. 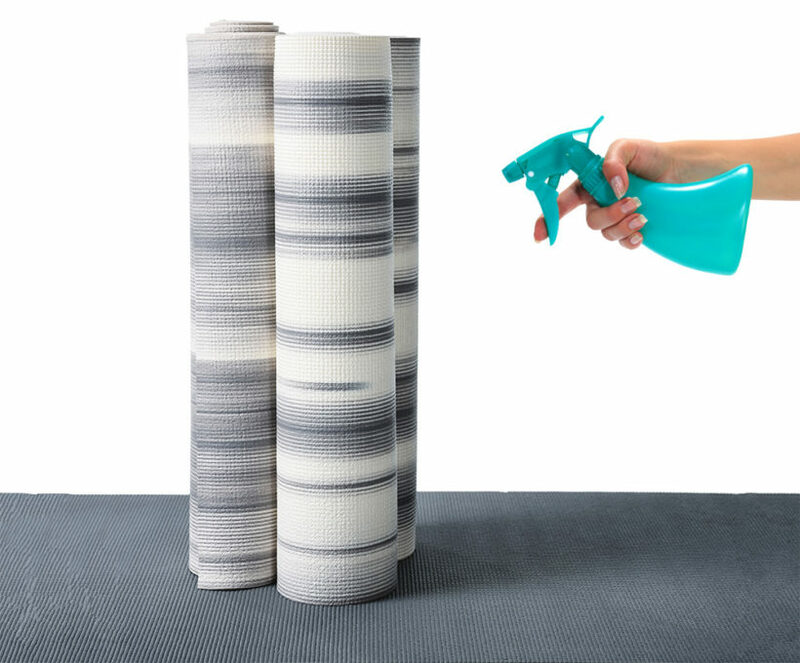 Sometimes life gets in the way or unexpected events leave your yoga mat heavily soiled, so you need a deep cleaning option. Check out both cleaning routines below to decide which will work best for you. This light yoga mat cleaning routine is good to do on a weekly basis or even daily if you go to a lot of hot yoga sessions. Regularly following this cleaning routine will keep your mat odor-free and help prevent the build-up of sweat and bacteria. Once your practice is done, spray the mat with a yoga mat cleaner (either a commercial one or the DIY cleaner below). Using a soft cloth, rub the mat to remove grime, dirt, sweat, and oils. If necessary, use a second soft cloth to make sure the mat is completely dry. Once the mat is dry, roll it up and store as usual. That’s it! If you regularly follow this simple routine, you mat will remain clean and odor free. Fill your bathtub with warm water, just deep enough to completely submerge the mat. Add a quarter cup of dish soap or hypoallergenic laundry detergent as you fill the tub. Submerged your mat in the soapy water and let it soak for five minutes. Use a soft cloth to gently wash each side of the mat, removing dirt and grime. Drain the tub and rinse the mat with clean water until all the soap and grime is gone. Shake your mat off to remove excess water. Lay a dry towel or two on the floor. Place your mat flat on the towel and roll the two up together. squeeze gently to remove the rest of the moisture. Unrolled the mat and towel and have your mat to dry. Make sure to do this indoors because hanging your mat in the sun can cause it to dry out too much and become brittle. Use a laundry rack, hanger with clips, or a shower curtain rod. Once your mat is completely dry it’s ready to use again. 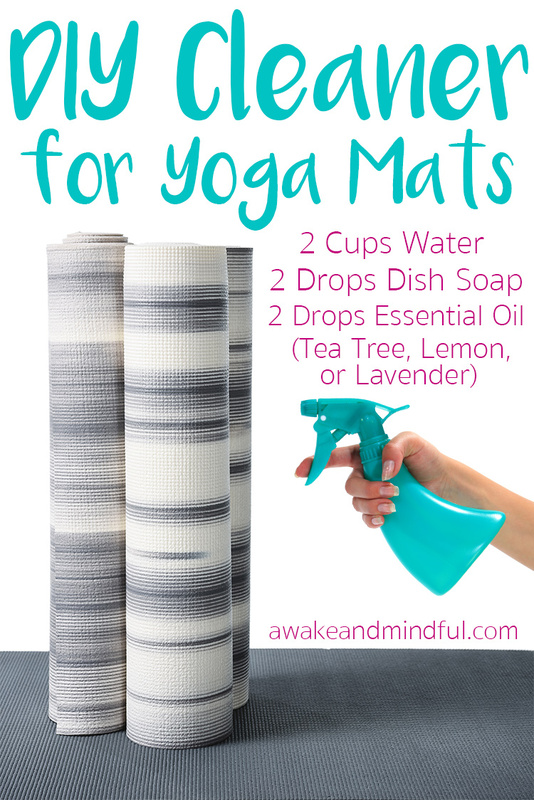 This spray is easy to make and great for regular, light cleaning of your yoga mat. Pour the warm water in the spray bottle. Add two drops of dish soap. If you want, add a little of an essential oil for anti-fungal properties. Make sure you are not allergic to any oil you use. Tea Tree Oil, Lavender, and Lemon Oil are all great choices. Only add one or two drops to avoid degrading your mat. Shake the bottle until it’s thoroughly mixed. Use the cleaner to spray down your mat and wipe with a clean cloth. New to yoga? Check out the must have yoga gear for a home practice. Want to take your yoga on the go? These are the best travel yoga mats.